In the immortal words of the musician Robert Fripp, "Discipline is never an end in itself, only a means to an end." The same could be said about workflow. 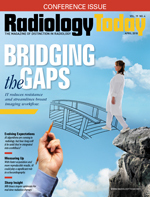 Better workflow makes radiologists' and technologists' lives easier, but it's ultimately about delivering care more effectively. With that in mind, each of the articles in this issue, in its own way, deals with an aspect of workflow that promises to improve patient care. Our cover feature surveys the changing landscape of breast imaging and the growing need to pull data from disparate image systems and databases. Kathy Hardy delves into the ways that IT is connecting these systems to meet the needs of breast imaging centers and their patients. With practices growing and newer imaging modalities gaining in popularity, interoperability is becoming a necessity. People are also looking for ways to integrate artificial intelligence (AI) into workflow. There are quite a few algorithms that can identify specific features in medical images and reliably measure them, but using 20 different algorithms to look for 20 different medical conditions is hardly optimal. To be truly useful, those algorithms are going to have to run seamlessly within established radiology workflows. Keith Loria reports on where the technology is now, and where the experts think it's going. The ability to take accurate measurements has many cardiovascular imagers excited about AI's potential in echocardiography. As Beth W. Orenstein writes, increasing volumes of echo studies combined with the intermittent use of 3D echo have made it extremely difficult for imagers to precisely measure all of the heart's valves and chambers in a timely manner. To ease the burden of taking measurements as well as improve image acquisition, some vendors are adding AI capabilities to their echo workflow. Many in the field believe AI will be a useful tool going forward. Accurate measurements and seamless workflow were also the driving forces behind the innovation that Dan Harvey describes in our fourth feature, the use of real-time MRI to guide radiation therapy. MRI offers better visualization than CT in many areas of the body. It also allows precise radiation delivery to tissues and organs that move due to patient respiration. Harvey reports that data from recent studies of MR-guided radiation therapy show promising results. He also notes that physicians are excited about its potential effect on workflow and patient care.